All moms know that you try to make the absolute most out of every single moment of the day. With so many "to-do's" that are just part of the job, the "want-to's" get relegated to those snatches of "meantimes". You know what I mean right? While waiting on the phone you_____ ,while eating your lunch you_____ ,while cooking supper you______. The blanks get filled in with bits like cut out words for your paintings. Or wrote a quick blogpost, or checked fb, or threw another coat of modge podge or paint on whatever project you're working on, or desperately hunt for your son's overdue library books. It's all part of the job. If you can do several things at once you feel like you've accomplished something. If you actually slow down enough to do one thing at a time you probably feel like you're wasting time or not accomplishing what you need to. Maybe it's not just a mom thing, but I know that I recognized myself doing it more once I became a mom. So today, while eating a late lunch and in the hopes of posting this before I have to pick up my son in half an hour, I thought I'd show you some of the things I've cobbled together during my "meantimes" this week. Have a GREAT WEEKEND EVERYONE and THANK YOU SO MUCH FOR YOUR SWEET SWEET COMMENTS this week!!!!!! You're all so amazing and I appreciate you!!! So I was going to wait to tell you about the article I have in the May/June issue of Cloth Paper Scissors magazine until I actually had it in my hand. My super amazing friend: Have you seen the new CPS? My friend: You're on the COVER. I'll see if I can send you pics. I actually shouted a "YES" then and threw my arms in the air, which really confused my mom, who I was sitting at lunch with. So I got to tell her right away and she of course being my mom, wanted to go straight to the nearest retailer to pick up a copy. It is the MAY issue though so it should hit the newstands soon. I can't wait!!! The article is about taking your art journaling 3d- and creating mixed media art with the actual journal entries. It's the first I've written for CPS and I loved working with them- I'd highly recommend it. :) The video I posted last week on Youtube is actually a companion piece to the article so after you've had a chance to check out the article, head on over to youtube and you'll see what I mean. Thanks for sharing the moment with me and I would love to have you take a look at my article. Yay!!! How to get published at Stampington, All about Copyright, and what to put in your Book Proposal- Plus a free E-Book all about Wire!!! Another interesting series of articles on the site were written by the fabulous Rice Freeman Zachary about copyrights. It's an area I've become increasingly interested in and increasingly confused by. What can you use? Can't you use anything that's an art material? Isn't that the purpose of people creating art materials? What kind of credit do you need to give for what materials? Honestly, it's a headache I think many of us avoid by either looking the other way, or erring on the side of caution and refusing to use anything that was artist designed. I hate to admit that although I feel like you should be able to use things I'm increasingly avoiding artist designed supplies in the work I intend to sell. One final super cool thing about the site- they are now offering a new e-book for free. The first e-book was titled Stitched Up and contained projects that involved stitching. 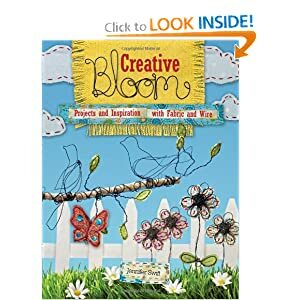 Their second e-book has now debuted and is titled Wired Up and contains the Scribble Heart Project from my book, Creative Bloom. How cool is that? SO if any of these little bits of topics interest you- and how can they not- head on over to Create Mixed Media today!!! Some time ago I talked a bit about the book, A Savvy Crafter's Guide to Success by Sandra McCall, and how it started me thinking about the different tracks/roads an artist can choose. I was trying to decide if I should accept some proposals to put my art into some local stores or if I should try to concentrate on etsy, the blog, submitting to magazines, etc. What I wanted was a sign of sorts. Something that would help me clarify my direction. As a stay at home mom my time is still fairly limited and I've learned I can't spread myself too thin. I needed to make some choices. It's funny but not long after writing that post my husband did my taxes. He hates doing my taxes. It's only because he likes me - a lot - that he will do this for me. I could try to do them myself but honestly, that's not something that's even remotely close to any skill set that I possess. So after an apparently grueling day of tax work he came to me and said "Please, can you not sell anywhere but online this year?" I guess it really gums up the process to have multiple shops and art fairs to account for. Plus, I have some income generated from writing, and now the book royalties so my once not so hard taxes are getting pretty laborious to sort out. I feel for him. He was doing it on a volunteer basis, after all. And I thought this might be the sign I'd been looking for. The one that led in an actual direction. So I thought that this year I'll try it.This year I'll concentrate on my art, my writing and submitting to magazines, and on developing my online presence. And then suddenly, it seemed so much simpler to be me. With this one decision I took all the directions I'd felt pulled in and cut out half of them. By saying, "not now" to some roads I wasn't saying "not ever", and I was freeing myself up to put some concentrated energy into other projects. What other projects you may ask? I can't tell yet. But I'm super excited to have somethings to show you soon. And I figure, if I'm super excited than I might have made the right choice. What do you think? So I had a fling with spring today. It was warmer then it's been yet (mid 50's= t-shirt weather here) and I spent a little bit of time outside. The tulips are starting to poke out of the ground and the trees have buds. Spring is truly on it's way. At LAST!!! So to urge it on a little I decided to make a couple of spring-y pieces of wire wall art for my etsy shop. I just listed two of the items, the third is still in the works. and a little bitty bird on a branch- So Sweet! 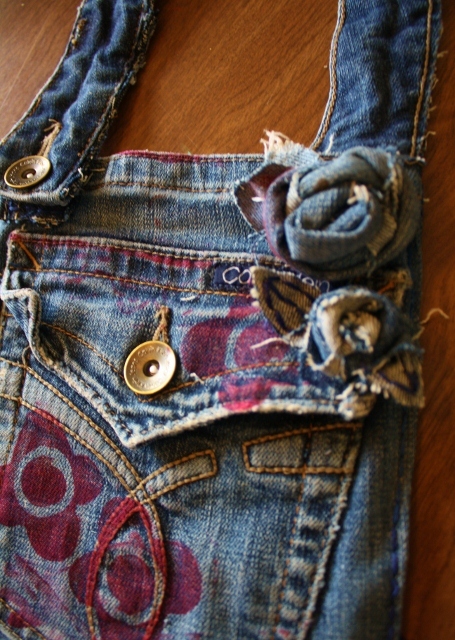 The "Waist not... Pocket Purse"
Step One: Cut off the waste band of your jeans and then cut off the belt loops. Set aside. Then, cut a rectangle that's approx. 8 1/2"wide x 12" long. 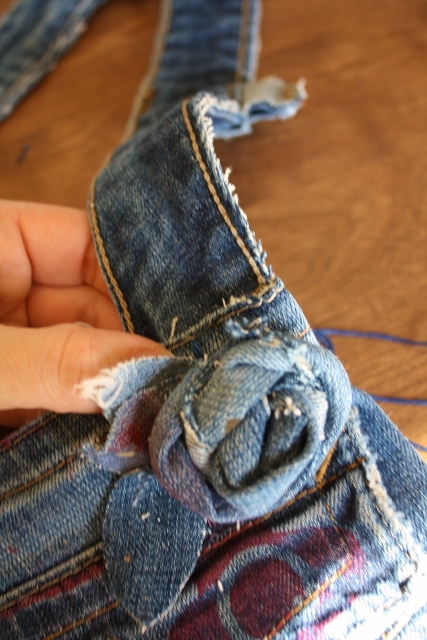 Fabric piece should include the right back jeans pocket and back fabric of leg. (In the pic above you can see the left back pocket with leg fabric attached. I already used the right for this project when the pic was taken.) 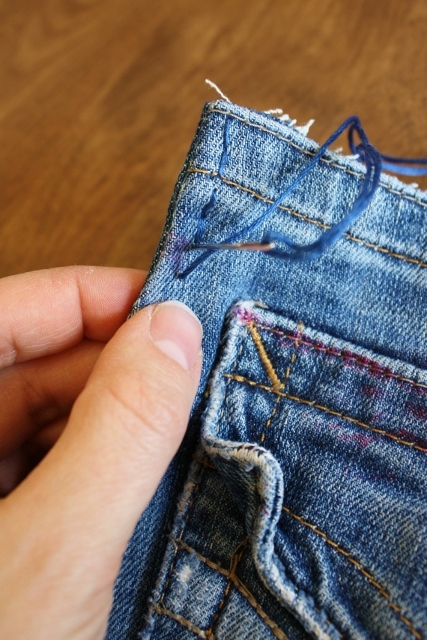 You will need to trim the fabric into a more regular rectangle shape. 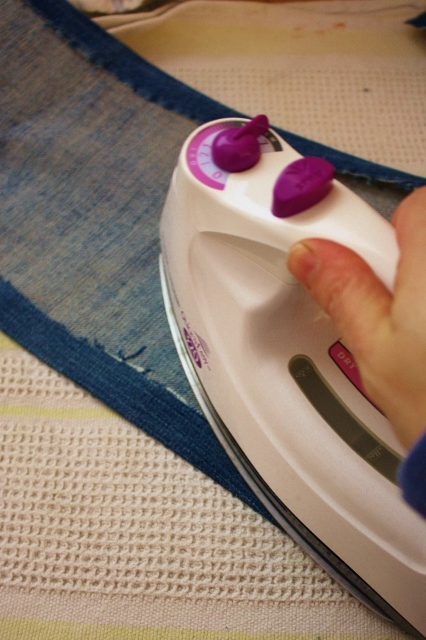 Fold the fabric in half length wise and then using an iron, press a seam all around the edge of the fabric. Step Two: Then, cut a second piece of fabric that is approx. the same width but only 8" in length. Position fabric, facing up, inside purse as backing as shown. Fold over seam at top back of bag and slide fabric beneath. 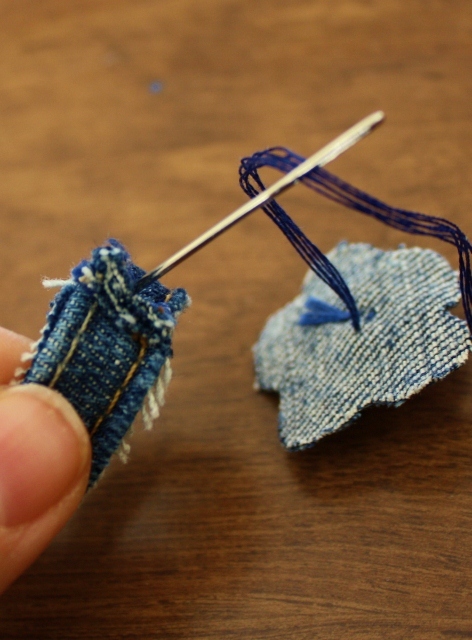 Using needle and thread stitch through fabric tacking edge down. Step Three: Using a needle threaded with embroidery floss, back stitch the left and right edges of the purse shut. Beginning at the top of each side. Step Four: Place the end of the waist band that does not have the button hole beneath the top fabric on the far right side of the purse and stitch to top fabric. Step Five: Place the fabric square that has the button still attached on the far left side of the front of the purse and stitch around edge to secure. Then slip buttonhole end of the waist band over the button to secure strap. Optional: I added decoration to my purse in two ways. First, I stamped the fabric with Staz-on ink and one of my hand cut stamps before I began the purse. Second, I added little jean rosettes and stitched leaves to the right side of the purse. Again, these two steps are purely optional, I just thought they'd be fun to try and might look cute. Feel free to add embroidery, or other stamped images or to applique to your purse. Just have fun!!! I have this little ring. It's cute and sweet and so so comfy to wear and I love it. :) This ring builds off of two previous tutorials, the necklace and the cuff. 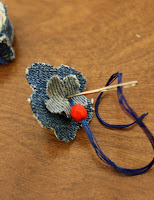 In the necklace tutorial I demo'd how to make a ring out of a piece of inseam. 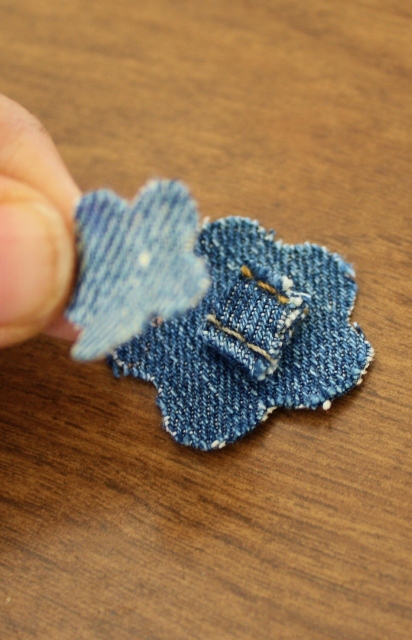 The cuff tutorial shows you how to cut the little flower shapes out of the denim jean fabric. This ring tutorial is sort of a mini tutorial because it really doesn't take much time or many steps to put one of these together. Especially if you already have the ring and fabric flowers cut. I'm going to post a sneak peek of next week's bag project at the bottom of this post. Have a great weekend and why not take a couple of minutes to sit back, grab some coffee, and enjoy the tutorial! 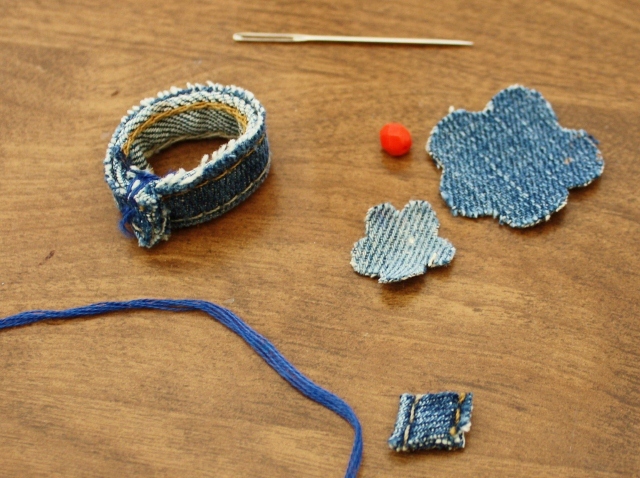 Step One: Following the steps in Tutorial #3- denim necklace, cut a thin piece of stitched inseam from a pair of jeans and fitting it around your finger for size, stitch closed. Step Two: Time to layer the blooms. 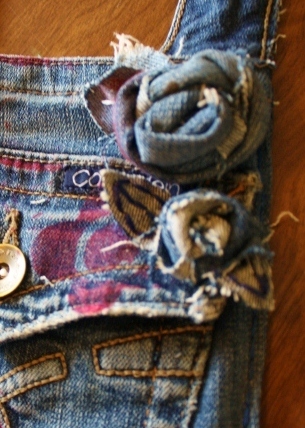 For more dimension I cut a super small square little piece of inseam from my old jeans and placed this between the two blooms I had cut out previously. Step Three: Using a needle and thread knotted on one end I stitched up from the back of my little stack, through the layers and then back on down. 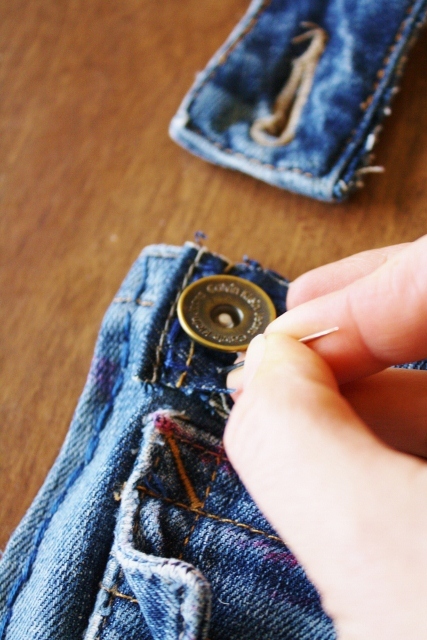 Repeat a couple of times and then add the little bead or button on top and stitch through that and back down. secure as possible. Then slip it on and enjoy!